The second adventure in the ZEITGEIST adventure path! Summer smog conceals the skies over Flint, and the skyseers, once able to foretell the future in the wheeling heavens, are blind and discredited. Unnatural tremors shake the city. Protesters brawl with police in the factory district. Fires burn in Flint's heart. An assassin flies on the wind. Foreign ships smuggle in magic arms, ready for a civil war. But the greatest threat is hidden beyond the sight of men. When a woman is murdered in the Danoran consulate, the party's investigation threatens to unearth a conspiracy, and those in power move to silence all who might reveal them. Only with the guidance of an old dying prophet will the party have a chance to pierce the conspiracy's veil, and save Flint from a coming doom. An adventure for inquisitive heroes of 2nd-3rd level. The second module in EN Publishing's steampunk AP ZEITGEIST is 95 pages long, 1 page front cover, 1 page editorial, 1 page ToC, 1 page SRD and 1 page back cover, leaving us with 90 pages of module, so let's check this out! In the last adventure of the AP, the new constables of the RHC have not only foiled a dastardly assassination/sabotage-plot and even prevent a war - but in the process of doing so, have helped the hereditary enemy of their nation. Now if one of the PCs is aligned with the mysterious Vekeshi, they will have a gift for a specific individual they'll meet during the module, setting up a component of the AP's massively complex meta-plot: Speaking of complex: The complexity of this module's investigation is rather refreshing and has some neat guidelines for DMs - the RHC Protocol. In the absence of phones and similar means of communication, the office and fellow constables can deliver clues, hints etc., people can be questioned and gleaned information consolidated. To help the DM, a roster of NPC-table is provided. When field work comes around, it does so in the form of a woman jumping from the fourth floor window of the Danoran consulate, crashing on the fence. When they arrive at the scene, Julian LeBrix, security chief of the Danorans gives them the run-down: The woman is question was known by the name of Nilasa Hume, supposedly stealing some valuables and making off to escape and subsequently shot by Julian - he makes clear that he wants this resolved ASAP. But do the PCs resolve this mystery - it turns out the lady in question has actually managed to smuggle fey peppers in and in the resorting lull that still affects the staff. Moreso, the woman, with her dying breath, entrusted a couple of things to a man who subsequently vanished - and there are A LOT of other clues that slowly start to tie together - via the clues gathered and the criminal record of the deceased, the PCs will hopefully have a lead towards the Thinking Man's Tavern. And even if the PCs both/mess up, you still have the newspaper, the fellow constables and even the PC's very own background and associates - a masterful entwinement of storythreads. While researching contacts at the tavern, a minor quake foreshadows the things to come and may even partake in a philosophical discussion about the validity of the very authority they represent. If the RHC's agents do their job well, they may learn about the smugglers Nilasa was in league with - they are currently incarcerated in the Goodson Esturial Reformatory - a glorified prison barge. There, they can negotiate a deal with one or both incarcerated burglars. Both know about Nilasa's association with newcomers to town, a shadowy organization dubbing itself "The Family". They also know about her having a whole cache of magic wands and that the delivery would happen on the 4th of Summer by someone called "The House Elf". So who is this strange "House Elf"? Via the fey pepper or clues gained from the smugglers, the constables can track the conspiracy to a weird couple of gnomes - who actually have a valid escape plan and some precautions that make sense and should make arresting them or getting meaningful information from them rather difficult. Now if they manage to interrogate one of the gnomes and find out more details about the planned smuggling. Morgan Cippiano, head of the local Family, invites them to coffee and cakes to talk about a business proposal of common interests, allowing the RHC constables to get prestige and an understanding with the family - and offering yet another help for stumped investigators. With the family's involvement cleared for now, the PCs might wish to check out Heward Alkahest's Factory, where Nilasa once worked - here, they can also stock up on acids and alchemical compounds, should they so desire. He also drops the name of the famous Skyseer Nevard. On their way to seeing him, they can foil a kidnapping attempt, save a life and generally do their job while on the way to seeing the ancient titular skyseer - who is dying and knows about Gale, the mysterious individual that put Nilasa on the tangent that led to her doom. His dying wish to the PCs is to be escorted to the top of the restricted area on Cauldron Hill - which the PCs can arrange with mayor Mcbannin. If they oblige, they may even perform a rather strange ritual that, while stemming from a dark magical tradition, may grant the old man the strength temporarily to not be as much a burden for the PCs. The meeting with Macbannin is also rather cool in that it foreshadows not only the things to come, but also sets up some interesting complications as well as driving home one point: The Hill is dangerous - goat's blood circles to ward off evil spirits and amulets to stave off the cursing effects of Cauldron Hill's peculiar brand of magical saturation due to a thin veil between the real world and the shadowy realm to which it's tied. After all this investigation, let's start the trek up this inhospitable place while hopefully keeping the dying prophet alive - by any means necessary! A whole encounter is devoted to getting up the hill and making camp - and should be used to drive home the tension and dread of the place - at the top, though, something goes wrong - horribly. Even with the strange visions and foreshadowing, the PCs should be rather on their heels when their defenses are sabotaged and the spectral creatures of Cauldron Hill start assaulting the PCs. It's a hold-the-line-scenario of the finest caliber. And the scenario does not end here - Alkahest factory is ablaze in the vision they receive and the PCs will have to hurry down the hill - only to meet Macbannin, who is trying to cover his tracks, which could come off as suspicious, but should not lead to more - at least for now. The PCs are also contacted by the mysterious Gale via a bird whispering to them. And she has important tidings: In the Bleak Gate, the strange mirror image of the city of Flint is bustling with a strange activity - there is something being built on the other side. And the PC's trials and tribulations on Cauldron Hill make them attuned to the strange energies of the Bleak Gate, enabling them to potentially trek the conspiracy, which seems to be linked with the Danorans. If there's the aforementioned Vekesh, s/he can also hand over the package and sway Gale in either a violent or non-violent direction. Unearthing the clue of the Danorans means that the story seems to be starting to come full circle - perhaps, with some of the clues unearthed over the course of the module, they'll now have a good chance of tracking down the mysterious fugitive person - after all, he seems to not have been in league with Gale. The man in question is one Dr. Wolfgang von Recklinghausen, who, via his contacts, has managed to go underground and seeks to escape - unfortunately, the thugs are on the payroll of Cillian Creed, who turns out to be the shadowy hunter that has been the source of their troubles on Cauldron Hill. He and an elite-squad of operatives try to take the Dr into custody/silence him. That is, the PCs could sneak out, deal with yet another hostage situation etc. - the stakes are set against them in this encounter and they better be smart or they'll also have to deal with the telekietic master of steelshaping Leon Qital. Whether they can or cannot save the Dr. or make off with his documents (which provide incriminating evidence linking the Danorans with a SMART, SUBTLE smuggling operation) - the ties come together slowly and the factory, as foreshadowed by the prophecy, will burn. Whether the constables have done their job and stopped the arsonists, Nevard is now gathering favors, while Gale is expecting an attack on the skyseer - to prevent that/following up on the arsony-attempt, they may find a creepy warehouse, containing a witchoil-infused golem (witchoil is made from souls, btw.!) and may question further technicians, though they fade back to the Bleak Gate. The speech of the skyseer will be attacked anyways, though the PCs can hopefully prevent the assassination attempt on Nevard, who imparts his visions to the crowd, warning them with a vision that is rather clear and providing a tantalizingly cryptic prophecy as well. Whether by a final warning/appeal sent by Creed or not - by now the PCs should have pieced together that mayor Macbannin is partial to what is going on and in fact the pupetteer. Taking down the mayor, though, is not as easy as it seems - he has allies, after all. Plus: A geyser of witchoil erupting from the ground turns out to be the result of the latest quake hitting his underground lab - thus a flood of witchoil is heading towards the nettles: Unless the PCs (with or without Macbannini) can stem the flow of the substance in his underground laboratory, resulting in a highly complex and imaginative climax. When he's off to court, though, he dies under mysterious circumstances - the conspiracy will not be thwarted that easily! The pdf also provides a quick reference list of NPCs and investigation-running for DMs to help them in juggling this complex scenario, a page of dramatis personae, 3 pages of ship rules, 2 pages handouts,3 new feats and new magic items and 11 pages of player-friendly maps sans keys - all in gorgeous full color. Editing and formatting are top-notch, I didn't notice any significant glitches. Layout adheres to a beautiful, paizo-level quality full-color 2-column standard and the artworks range from awesome to mediocre comic-style to unnecessary public domain art. The pdf comes fully bookmarked (with nested bookmarks) and with layers that let you strip it down to become printer-friendly. The second installment of the Zeitgeist AP is highly complex, intelligent and HARD to run. Even with all the help provided for the DM, the amount of ways in which the players can solve this complex mystery, the module still remains delightfully complex. A DM has to be up to his a-game and some experience under his/her belt to pull this off, but OH BOY! This investigation is actually better than most CoC-adventures I've recently read - it's complex, daunting and assumes thankfully that the players are intelligent and not some bumbling idiots. The NPCs react logically to PCs, have plans and believable motivations that don't make them look like lobotomized jerks and the writing is top-notch. this is one of the best investigation modules out there for PFRPG and actually imho a step up from the already excellent first offering of the AP. Congratulations and kudos to EN Publishing for a final verdict of 5 stars + endzeitgeist seal of approval! The Dying Skyseer, an adventure in the Zeitgeist adventure path by EN Publishing, cannot be called an adventure and hereby I'll dub it an “Experience”. What you have in these 90+ pages mixed between beautifully drawn works of art, well crafted maps with minute detail, and a script that reads out of a mystery novel transcends normal gaming. This is something different all together. This is the second part of the adventure path that had our PCs encounter jungle terrorists and board a steamship to vanquish a foe that led them to the courtroom of the realm and close out with the PCs becoming detectives. That arc continues onward in this Experience with the party joining up with the Risuri Homeland Constabulary (think of them as Pinkertons from the Old West) to discover why this young girl was fatally shot in a random act of violence. The party goes off on multiple threads all woven together with NPCs that have motives and reasons behind each of them, lists of plot points to discuss for the place in questions, mood settings that you as the DM can utilize to put yourself in the right frame to ratchet up the tension and create the right setting for the Experience. The Experience starts there and doesn't let you go as you run around the city chasing after the bad guys on boat, horse, carriage, over roof tops, through cairns, hills full of spirits, inside factories, and into the homes of the elite in the city of Flint. Your PCs are living inside an Experience much like they would if they were put in a season of “24”, if you can picture your players enjoying that type of murder-mystery intrigue then they will enjoy this Experience. How are the stats, the crunchy bits, the meat and heart of the product? One Word: Amazing. Each NPC has the full stat list, all the abilities listed for you, spells laid out, classes from the Advanced Player Guide (glad to see these new classes getting use), new monsters, new spells, new items, even some new traps that I will be using to make those PCs forget they were even there. The mind races with possibilities. Are there downfalls or some things to worry about with this adventure? Yes, and it comes down to the DM being prepared. There is enough information in these pages for you to run each encounter, NPC, area with all the information most PCs would ask or do. Ryan Nock has thought up nearly every scenario where if your PCs can think it, there's an easy answer for you as the DM to provide it. Of course your PCs will Zig when you want them to Zag, and the background information is vast enough to allow for wiggle room as they work their way through the Experience. If the DM hasn't read all the finer points, looked over the map, studied the mood and motives of the encounter a significant amount of mood and feel is lost. Be on your “A” game as you will need it here. With all this plot is there combat? Of course there is. Factory battles with fire going off around you, dark combat on the seas, chases on land that end up on the rooftops, warehouse battles with mass combat. Those of you like me who have PCs that thrive on combat will get their fix as the blend between Combat vs. Skill checks is very even and you can easily bluff, lie, cheat, or intimidate your way out (or into!) situations. 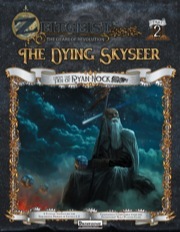 In closing, the Experience of The Dying Skyseer reads like a Tom Clancy or Vince Flynn novel. You are the detectives hunting down the death of a common girl who was embroiled in a conspiracy larger than any imaginable for a low level party. 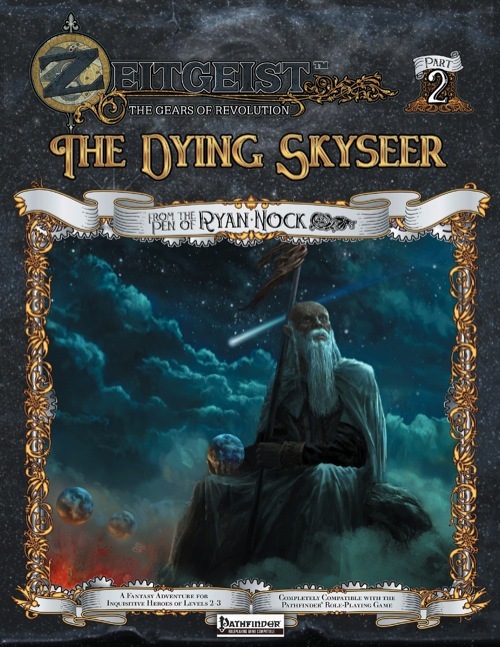 Through clever skill usage, crafted and interesting combat, and a story that inspires the imagination, The Dying Skyseer hits every note a good Adventure needs. Any idea when the print version of this will be released? Im not seeing the option to get the print version here or Drivethrurpg. I don't really want to advertise a competing store on Paizo's own website, but I just checked and it is certainly right there at drivethrurpg and rpgnow. It's not here because Paizo unfortunately doesn't have a print-on-demand option; but if they ever do, the softcover versions will be here also. Ordered and thnx! Looking forward to the next installment. My review for this is coming up shortly. For those of you curious to know what this one is like think of a Murder Mystery type of game like Clue. Each part of the plot is one part of the "Who Done It" and the entire story is interwoven with plot points and ideas for you to use to heighten your game to a new level of intrigue and suspense. . They act or don't act, the world moves forward without them and their action or inaction has massive consequences on the outcome. This is like a Vince Flynn or a Tom Clancy novel or a season of 24, that's how I'm picturing this adventure in my mind. Posted my review. I honestly didn't want to put the adventure down until it was over. It was worth reading 3 times through as I totally enjoyed the writing and the atmosphere. And reviewed here, on DTRPG, sent to GMS magazine, posted about it on RPGaggression and submitted it to Nerdtrek. Cheers! Just to add to Endzeitgeist's review of the adventure, I'll say that the Print-on-Demand version is of excellent quality. Sturdy paper and I've noticed no issues with the contents, except for the very minor nitpick that there's no text on the book's spine. For those of you who like your deadwood versions, I'll definitely recommend that you consider the Print-on-Demand option available through DriveThruRPG. This goes for all five installments that have been released so far, not just ZEITGEIST #2: The Dying Skyseer. Awesome review! Thank you, Endzeitgeist! It's always very encouraging when folks take the time to let you know they're enjoying your work! Russell, I LOVE the AP, even more so than I did Burning Sky. I'm currently reading the 3rd volume and it's just as neat! I hope you guys can keep up this wonderful complexity. One of these days, I'll also buy the fifth, since Razor Coast ate my funds for the month.